Sometimes you don’t know you need something until you need it. This is very often true when it comes to hydraulic hose assemblies. It is essential for businesses that rely on equipment that uses a hydraulic system to know where to go to get custom hydraulic hoses while you wait. Metro Industrial Supply and Services is a well-known hydraulic hose shop near Fall River, Massachusetts. We specialize in providing a wide range of products and services for industrial and marine customers in the Southcoast region. However, we also ship products to customers across the country and around the globe. One of our most popular services is the design and creation of custom hydraulic hose assemblies. Customers rely on our team of highly trained and experienced technicians to provide them with same-day services for Greater Fall River hydraulic hose assemblies. In some cases, we are able to build hydraulic hoses while you wait, ensuring that our customers get the parts and components they need promptly to reduce downtime. When you experience a hose failure or breakdown of any kind, it is important to get it fixed right away. A hydraulic hose is an integral part of any hydraulic system, whether it is used for industrial purposes in manufacturing, agriculture, or construction. It can also be used with mobile equipment, transportation, and marine industries, just to name a few. The hydraulic hose is the means by which the hydraulic fluid is transported from one component to another. The fluid is often at extreme temperature and high-pressure ratings during operation. This is why it is important to choose the proper type of hose, couplings, and accessories when you have to replace existing hose due to wear and tear or after a failure. 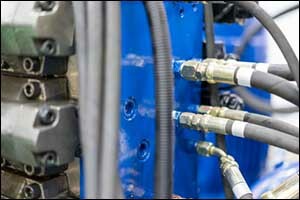 At Metro Industrial & Marine Supply, we specialize in the design and creation of custom hydraulic hoses while you wait. Our industrial supply and services shop is located in New Bedford, Massachusetts and we serve the surrounding communities and regions. We also have customers that order from us for shipment across the country and around the globe. We have the capacity to create custom made-to-order Fall River hydraulic hose assemblies unlike any other supplier in the Southcoast area. Our technicians can offer up to 2″ 1-6 wire hydraulic hoses ranging from 1/4″ ID to 2″ ID, four spiral, ultra-high pressure, ultra-low pressure, crimp fittings, and various metals for US and metric ends. When you need replacement hoses for your industrial hydraulic equipment, the faster you can get the parts you need, the quicker you can get back to work. The best way to reduce downtime for hydraulic equipment is to work with reputable industrial supply and services companies in your local area. Our hydraulic hose shop near Fall River can create custom solutions. In the world of hydraulic equipment, there is no one-size-fits-all option. There are so many unique parameters that must be considered in the design and production of hydraulic hoses while you wait, that it has become nearly impossible to purchase standard hydraulic hoses that will actually fit. Our technicians work with each customer to assess their individual needs to create custom Greater Fall River hydraulic hose assemblies according to their specifications. Our technical services go above and beyond anything you will ever find at our competitors’ shops to provide top quality results for our customers. From flexible hose to high-pressure, heavy-duty models, Metro Industrial & Marine supply can deliver the custom hydraulic hose assemblies you need to keep everything safe and operational. At Metro Industrial & Marine Supply, we take pride in the quality work that we do, the professional services we offer, and the unmatched customer service that we provide. Since 2001, we have been a fixture in the Southcoast area, working hard to earn a solid reputation for providing top quality products and services to our customers. We work with a wide variety of industries, organizations, and customers locally, nationally, and internationally, shipping our Greater Fall River hydraulic hose assemblies all over the globe. Our sales team has over 80 years of combined industrial sales experience, which helps us to provide you with the very best customer service and attention to detail required to meet all of your needs effectively. If you are interested in learning more about our industrial supply and services or if you would like to discuss your needs for custom hoses at our hydraulic hose shop near Fall River, give us a call at 508-996-8400. We would be happy to answer all of your questions about how to get custom hydraulic hose assemblies and other industrial supplies for your business in the Southeastern Massachusetts area.